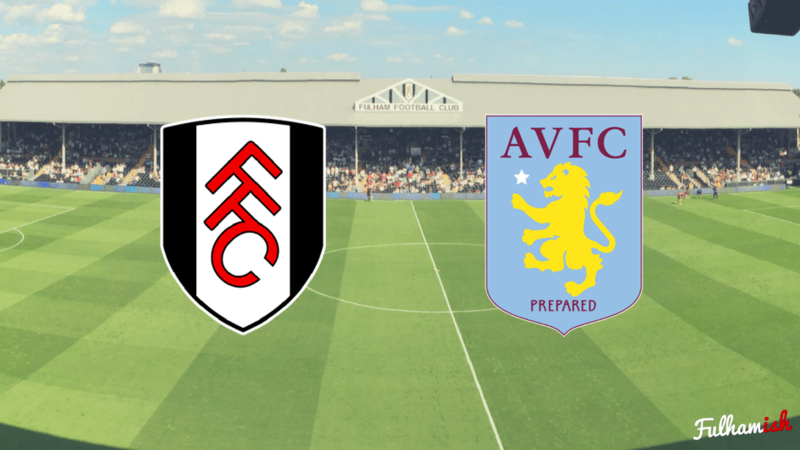 Fulham are back at the Cottage this Saturday, facing high-flying Aston Villa, who have won their last seven games on the trot. Running the rule over the John Terry and the rest of the Villains, it’s George Singer that has you covered as ever. Hello and welcome to another edition of Before the Whilstle! Today, I preview our upcoming crunch match, a thriller against the Villa, and look at what we need to do in order to gain 3 hugely valuable points against an opposition in terrific form. The last time we met the Lions was back in October at Villa park, where the Birmingham side earned a narrow (yet well deserved) 3 points. Frustratingly for Whites fans, the opener was scored by Villain-in-chief John Terry – the new team captain heading home a freekick from Hourihane. The entertaining first half was brought to an end with a Fulham equaliser; Johansen scoring a curled free kick – something which has since become a bit of a speciality for the Norwegian. However, an early second half goal for Adomah was enough to seal the points for the Villains, with Fulham again hurt by their continuing habit of leaving opposition players unmarked in dangerous positions. Despite Fulham bossing possession, Villa created far more opportunities and deserved the win. As we attempt to reverse the result, what kind of Villa setup should Fulham prepare against? How will Villa line up? As they have done throughout their impressive 6 match win streak, I’d expect Villa to line up in a 4-1-4-1 formation. Despite looking initially like a defensive setup, Bruce has cleverly used this formation to balance his talented attacking players into a well drilled team. A revitalised Jack Grealish, with his more defensive partner Hourihane, push up high to support Hogan, and ensure the lone striker doesn’t get isolated. They also offer plenty of potency from out wide, with wingers and fullbacks consistently combining to terrorise opposition defences. Where do Villa’s attacks come from? The above graphic is one way of showing how Aston Villa create chances. The position of each player shows the average position of where they create chances – and the line points to where (on average) their chances land. The graphic shows Villa’s tendency to create chances from out wide, especially on the right flank. In particular, it shows how Snodgrass likes to cut inside from wide to create chances, and El Mohamady likes to overlap and cross the ball in from a wider position. The balls into the box often come from deep too – with the Villains preferring to create chances by knocking balls into the box for their striker run onto. The Egyptian right back El Mohamady. Ahmed was my man to watch in the reverse fixture, and since that match he has continued to create plenty of chances with crossed deliveries from right back. He’s a strong attacking outlet, and one we’ll need to be wary of. However, the man I’ve chosen is the once-forgotten, Premier League exile: Robert Snodgrass. Since being harshly outcasted by West Ham, after struggling to immediately replace Dimitri Payet, Snodgrass swapped Claret kits and moved back to the Championship with Aston Villa. Since moving, he’s been one of the standout wingers in the league, recreating the great form he enjoyed as the talisman for Hull City. Snodgrass’ radar – offering both goals an assists, and pulling his weight in defence. A hugely successful season so far for the Scot. He’s been directly involved in 15 goals this season: 9 assists and 6 goals. 8 of these have come in the last 9 games, a sign he’s a player in top form. His main weapon is his deadly delivery into the box, both from set pieces and crosses. Often cutting inside to move the ball onto his left foot, the Scot has deadly precision with his strikes – as seen below with his last minute winner at promotion rivals Sheffield United. Be wary of Villa’s right flank: Snodgrass and El Mohamady combine and complement each other well, and form one of the deadliest wide partnerships in the league. As Snodgrass is a left footer, he uses El Mohamady’s ability to overlap to free up space to cut inside to. For instance, in the gif above, look how El Mohamady’s run distracts the defender, and gives Snodgrass a yard of space to move into. We should aim to always have 2 men back, and force Snodgrass onto his weaker right foot. We also need to be careful about giving silly fouls away. Snodgrass has wonderful dead-ball delivery and the last thing we want to do is give our friend Terry a chance to score his second of the season.